These workings are part of the Westmorland Green Slate belt that stretches from the Duddon Valley in the south-west to Mosedale in the north-east. Lying at the head of Longsleddale, Wrengill is therefore close to the north eastern limit of green slate working in the southern Lake District. This geographical distribution is a simple reflection of the geology – readers will know this – but less well known is a further geological truth: the cleavage of the slates is aligned parallel to the line along which two formerly separate continents collided about 400 million years ago. It was the stress associated with this collision that produced the cleavage. 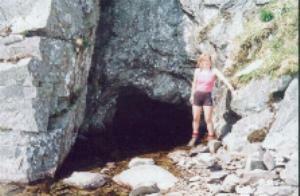 Wrengill Quarry (SD 475085) was the subject of the Cumbria Industrial History Society’s first visit, on the 12th July 1987. On that occasion the general configuration of the site was mapped, showing surviving remains and the reconstructed tramways (1) and (11). Bridges (2) and (15) were also shown, though only their approaches survive. Four identifiable workings survive. (3) and (12) are open pits, the former being connected to a smaller open working containing riving sheds (5) and (4) by a narrow quarried gorge. A well preserved closehead (10) penetrates the ground between these three surface workings. 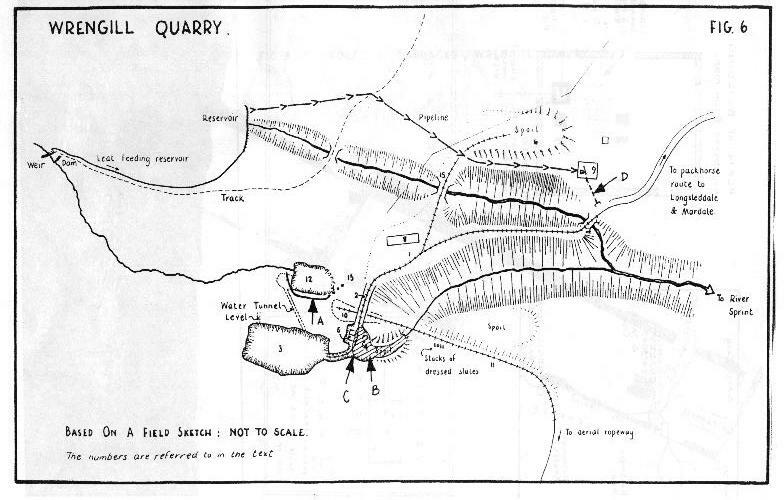 Drainage was a severe problem as open pit (12) was opened directly across the beck. Two solutions were adopted. The earlier appears to be a stone causeway (Arrow A) that skirts the edge of the quarry, originating at the point where the beck presently plunges into (12) as a dramatic waterfall. The causeway must have supported a wooden leat, and the presence of three closely spaced drystone pillars (13), positioned at a point where the causeways abruptly ends, suggests that the water continued on a launder, though where it went thereafter is unclear. Later a more drastic solution appeared in the form of a drainage tunnel leading to (3), implying that this larger quarry had ceased working. One wonders how satisfactory either of these solutions proved to be in view of the potential for torrential rainfall. The most conspicuous change recorded by our party was a large area of erosion (Arrow B – the shaded area) that had destroyed the riving shed (4) and had flushed out most of a long steep ramp of spoil. This must have been caused by quarry (3) filling with enough water to produce a dam-burst effect. The aficionados of drill holes would be well please by a visit to (Arrow C), where a small group of star-shaped holes, one having five clear points, has been preserved. They are randomly arranged and may be evidence of a bit of fun being had in an otherwise uncompromising working environment. Closehead (10) still contains air lines and a tramway track. It is wet and muddy underfoot, but seemingly safe to explore. A further exploration of the pelton house (9) was undertaken by one of our members who entered the pelton wheel drainage tunnel (Arrow D) at its discharge end and emerged at the input end. Whilst down there he noted that the arrangement was not as simple as anticipated, with a further length of tunnel joining the expected one, and at an odd angle. Collapse prevents further exploration, and it is unclear from the surface remains where it originates. The pelton house itself was already a flattened ruin in 1987, so further deterioration was not possible. The feed system for the pelton wheel still survives with a long length of rusty, battered pipeline in situ, and the dams, leat and sluice housings are all clearly preserved. The aerial ropeway indicated on the map was purchased c.1945, but never erected. This is, then, an interesting site to visit. Apart from storm damage the remains are little changed since 1987, though fewer metal artefacts were seen. Assorted tubs and bogies have gone, though some may have been washed further down the beck. The bellows nozzle has been removed from the building block (8). 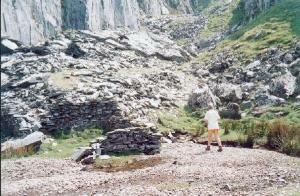 So should you find yourself near Gatesgarth, go and have a look. Even a cursory examination will take you a couple of hours. A thorough investigation will give you a full day of entertainment.